Conan O’Brien proudly joins The Walking Dead on last night's Conan show. With the midseason return of the Season 4 of AMC's The Walking Dead this Sunday, last night's Conan show featured the cast of the critically acclaimed live-action TV adaptation of the popular comic book series by Robert Kirkman, Tony Moore and Charlie Adlard. 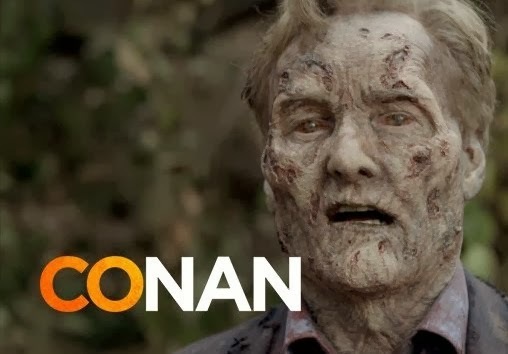 And to properly greet the cast, Conan O’Brien became a full-fledged member of the undead, complete with a cool cold open for the show featuring himself in the grisly zombie get-up that we have come to expect from The Walking Dead. Hit the jump to check out the awesome cold open. Meanwhile, AMC continues their viral marketing in the form of zombie prank following their assault on Daryl Dixon back in Japan. This time, unsuspecting New Yorkers are the victims as they passed by the deadly grate on the streets of New York.